If you grew up with Mac computers in the late 80s and early 90s, you may remember an old game, Scarab of Ra! Scarab of Ra was a dungeon crawl type game that takes place in an Egyptian pyramid. The goal was to find three pieces of treasure. The Crown, Staff, and Scarab of Ra. The maze through the pyramid starts at the top of the pyramid. Each level gets progressively larger as you venture deeper into the pyramid. It wasn’t just a maze though. There were also traps and enemies out to harm you. I was never able to beat the game, but I spent thousands of hours trying to find the three pieces of treasure. Legend of Grimrock feels very much like Scarab of Ra with a bit of Dungeons and Dragons thrown in. In Grimrock you explore a dungeon trying to find your way out. You control a party of four adventurers, and have to travel a maze of corridors and rooms, all while looking out for guards and monsters trying to kill you. I’ve had lots of fun playing so far, but I’ve died numerous times trying to explore. I’ll explore a large part of the dungeon and die, completely forgetting to save through the entire period. Queue repeat sequences, until I remember to save as I progress through the dungeon. I like this game, but replayability is somewhat low. It’s not a roguelike game like Scarab of Ra was, so the map will never change, but it does have a dungeon editor. 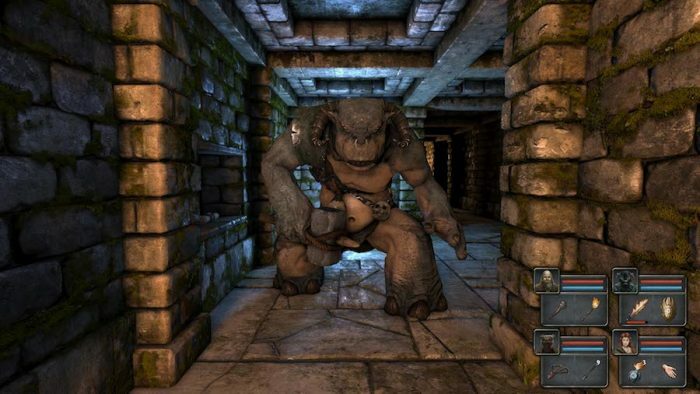 There are plenty of custom player created dungeons on Steam.